PART A: About AFRIKA KOMMT! AFRIKA KOMMT! receives valuable contributions from the German Federal Foreign Office (Auswärtiges Amt) and the German embassies in Sub-Saharan Africa. The program is supported by the Federal President of Germany Joachim Gauck. Part A – About AFRIKA KOMMT! 19 leading German enterprises founded the initiative AFRIKA KOMMT! in the year 2008 - the very first joint-initiative for capacity building by German industry. After the success of the first five program cycles, the sixth AFRIKA KOMMT! intake will follow on seamlessly with the application phase starting 12 December 2016. After four completed program years a significant number of the participants now work in the branch office of their respective partner company in Africa. Key elements of AFRIKA KOMMT! Refresher course in Africa, approx. 6-12 months after the stay in Germany, offering the former fellows to extend their networks with other alumni and to mutually benefit from their experiences. Application phase of the 6th intake. Travelling expenses - Flights, Visa, etc. The monthly allowance of € 750,- and the salary ensures an adequate standard of living in Germany. However, the amount is not sufficient to provide financial support for families or relatives and for this reason they cannot accompany the fellow to Germany. Additionally, the participants have to make arrangements to ensure the subsistence of their families in their home countries during their participation in the program. official certificate by the partner company upon successful completion of the internship. junior executives from Sub-Saharan Africa with several years of hands-on work experience, strong leadership qualities and a very high level of commitment and dedication. The following fellowship placements are available as part of AFRIKA KOMMT! 2016-2018. The third column shows the general background required for each placement. The button on the right side leads to further information on the specific profile needed. Please read it thoroughly before applying. Please note: You will have to apply for the whole program and not for a certain company or placement. There is no guarantee that the practical training in a specific company is possible. Four steps to apply for AFRIKA KOMMT! Recommendation: Please apply as soon as possible and not at the very end of the application period as the expected high number of applications might cause technical delays.  Step 1: Check the general candidate requirements – do you fit the criteria? 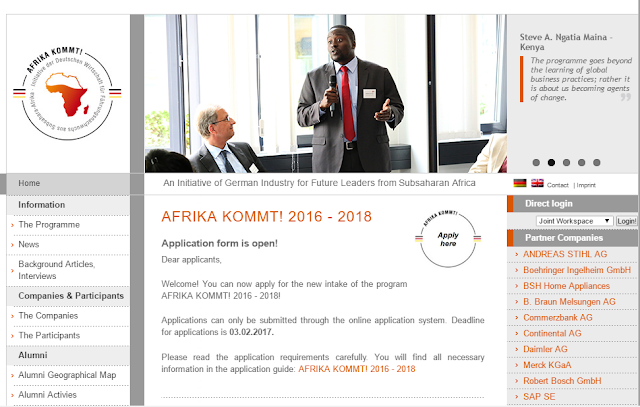  Step 2: Check the available placements and required profiles of the sixth intake of AFRIKA KOMMT! Application submitted - what happens next? Kenya, which will take place from 24.04.2017- 05.05.2017. The assessment center includes a number of tasks, group activities and presentations and serves as a basis for the final decision. The results of the assessment center will be communicated in May and June 2017 – successful candidates will then receive the invitation to Germany for one year! before applying or before the assessment center. After the one-year stay in Germany, all candidates have to return to their home countries. Alumni activities will continue and allow former fellows to extend their networks with other alumni and to mutually benefit from their experiences on an on-going basis. In case a company is interested in extending the cooperation with a candidate beyond the one-year stay in Germany, this has to be arranged bilaterally between the company and the candidate.